12 Days of Novellas – Day 9: S’nogged by Kayla Dawn Thomas: Review + Recipe! Welcome to the 12 Days of Novellas! We're on Day 9 and today I will be reviewing S'nogged by Kayla Dawn Thomas. Today's recipe is one not to be missed! Today's amazing recipe is brought to you from Kate over at Framed Cooks. Thanks so much for allowing me the use of this delicious treat! 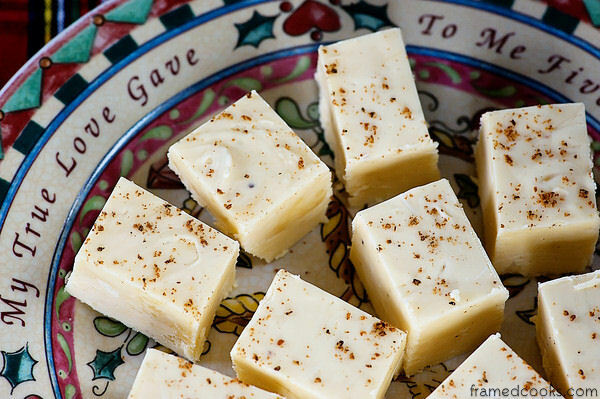 Grab the Recipe for Eggnog Fudge by clicking on the pic above…and then don't forget to head back here for your download of S'nogged and my review! Description: "All Jenna wants for Christmas is to snuggle up in her jammies and play computer games. She’s been doing her best to forget about Thad Benson and his gorgeous eyes and steamy kisses. Plus, her job as a Wayward Husband Wrangler has taken her to new extremes this year. Not a holiday nut, Jenna enjoys the opportunity to hole up and hide until after the New Year, but her mom and sister decide this is the year for a visit. For some reason Kennedy is concerned about the state of her underwear drawer, and the last thing on Jenna’s mind is hooking up with someone. However, the next thing she knows, Jenna is wrapped up in an eggnog-flavored kiss under some mistletoe…"
This entry was posted in 12 Days of Novellas, Book Reviews, Christmas, Fun & Games, Kindle Downloads, Recipes, Seasonal: Winter and tagged Chick Lit, Christmas Books, christmas cozy mysteries, christmas cozy mystery, christmas kindle downloads, christmas reading, download christmas cozy mysteries, easy egg nog fudge, egg nog fudge, egg nog fudge recipe, egg nog recipes, eggnog fudge, eggnog fudge recipe, eggnog recipes, how to make eggnog fudge, Kayla Dawn Thomas, Novellas, snogged review. ← 12 Days of Novellas – Day 8: Christmas at the Beach Cafe by Lucy Diamond: Review + Recipe! Looks like a great read and an amazing recipe. I make fudge ever year and I must try this.